Lunch we ate breakfast late since we had to check out early. Dinner was at our favourite Bumbi bali. I had my favourite from last week a Seafood Tumeric Coconut curry...sooooo Good. Hasil Laut Bumbu Kuning. D had a Chicken in Coconut. Siap Base Kalas Rp. 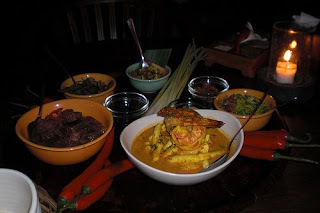 Our last dinner had to be Balinese and HAD to be something we new would be good. Recipes to come. I have to find the book they sell back in Canada. The book was pretty pricey at the restaurant. They serve the food with a few side veg almost like Korean Banchan. There was spinach, green papaya salad, beans. Very tasty, unexpected and very welcome.